For the month of July, I am offering huge savings to you in both my Etsy Shop and in my Ravelry store. Use the coupon code: ETSYJULY14 and take $4.00 off your total purchase of $8.00 or more. This offer is good in the shop: HerterCrochetDesigns on Etsy, and ends on July 31, 2014. 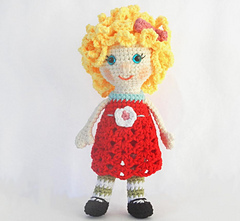 Use the coupon code: JULY2014 Get any pattern of your choice for free when you purchase my Millie the Doll pattern. This offer ends on July 31, 2014.